I live on the Olympic Peninsula. I love it here. 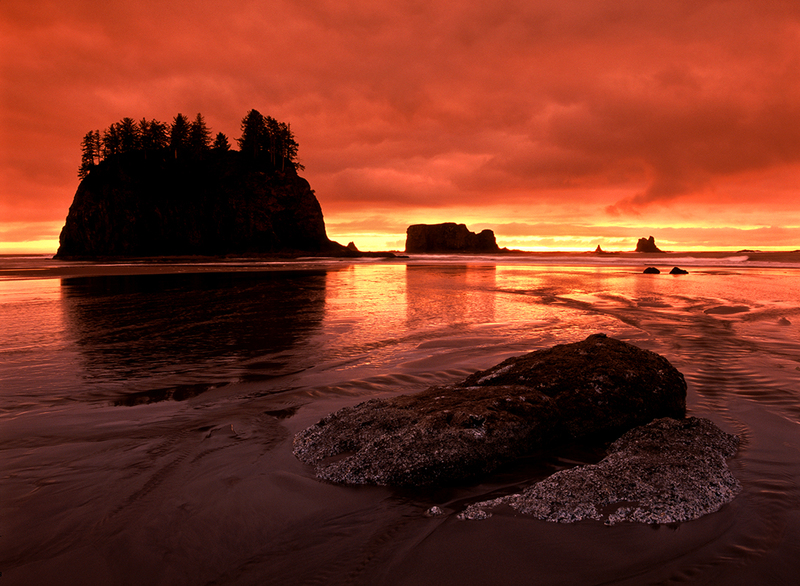 Some of my best memories come from backpacking, exploring, and photographing in Olympic National Park. This May I’m leading a workshop to one of the areas I know best. I’ve actually lost track of the number of times I’ve led trips to Olympic. Mid-May is traditionally the best time of the year for greens in the rain forest as well as good sunsets on the coast. For this reason, we’ll spend much our time visiting the rain forests, coastal beaches, It can also be a time of rain, so be prepared! Based out of Forks we’ll visit places like Rialto, Ruby, and Second Beach, the Hoh rain forest, Sol Duc Falls, Quinault and Lake Crescent. Weather allowing, we may also make the trek to Hurricane Ridge. In the field I’ll place the emphasis on using proper technique and craftsmanship behind the camera. In the classroom we’ll have group critiques, Lightroom and Photoshop demos, and presentations geared to help you refine your vision. Sunset over the Pacific Ocean at Second Beach in Olympic National Park, WA. Seattle, Washington, is surrounded by a necklace of three national parks, each wonderful in its own right: Mt. Rainier, Olympic and North Cascades. Of these, aptly named Olympic is located in the most northwestern corner of the contiguous United States on the remote Olympic Peninsula.